My favorite thing today is something that is quintessentially autumn. I can't imagine a Thanksgiving or Hallowe'en without them, and I love to see a field full of them on a golden autumn evening. A couple weeks ago I mentioned that a favorite of mine was the fall fair, and the award winning fruits and vegetables that are a part of the grand tradition of the fair. Well, naturally the giant pumpkins are my favorite. But apart from that, the bring me joy in so many other ways too. As a child, pumpkins provided my favorite part of Hallowe'en with the carving of the jack-o-lantern. There was so much thought and care that went into choosing the perfect pumpkin for carving. One had to be sure that it was a sufficient size, proper shape, and had a good heft. The heft is of course important, because that would ensure that there would be hidden within, a treasure trove of white seeds, perfect for roasting and salting for a crunchy, once a year treat. Once the pumpkin was sccoped out, seeds set aside, the pumpkin must be turned this way and that, while carving knife in hand, you decide on the perfect spot for the face. Ready? Carve out the eyes... happy, or diabolical? Carve a nose... triangle, upside or down? Mouth... toothy grin, or hollow 'O'? Lean back, twist the pumpkin slightly this way and that, and oh, isn't he perfect. The simple addition of a candle and he's ready to beckon trick-or-treaters and scare away the bogeys! 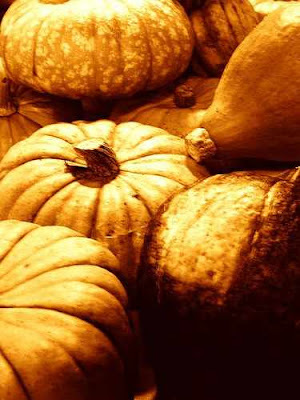 Honestly, can you think of any other squash to whom you would entrust such a task? As an adult, pumpkins provided my favorite part of Thanksgiving. Pumpkin pie, with just an added little dollop of whip cream is surely the most perfect after dinner treat. As I have gotten older, I've learned that pumpkins need not be kept for just a pie. Pumpkin muffins, scones, soup, risotto, pancakes... the list goes on and on. How did I not recognise the versatility? I love the matte orange sheen of the pumpkin skin. I love even the elongated yellow bloom that preceeds it, growing along the slightly prickly green stem. I love the look of a pumpkin reposing gently on a country home front porch; or correct little rows of them sitting at a market, full of undiscovered potential, just waiting for a buyer. On a day that looks and feels truly of autumn, at the start of the month that heralds the harvest, the pumpkin seems like a perfect pick for today's favorite thing, wouldn't you say? I LOVE pumpkins as decor around this time of year. Especially the small white ones called Baby Boos! I love pumpkins! They always seems to make a house so homey. I seen some white pumpkins the other day and think I will buy a couple this year, along with a scarecrow.